The VEG-BAG is the new sponsor of the Vegetarian Festival. 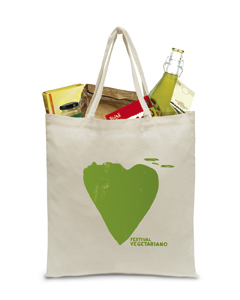 A practical shopping bag in 100 % biological cottons containing selected products of the best bio-certified Italian companies, created by the Vegetarian Festival for your eco-friendly shopping! At the Vegetarian Festival! As a gadget during the second edition of the Festival, the VEG-BAG was such a great success among the audience and the participating companies that on Sunday, September 4, 2011 over 750 bags were sold! Thanks to the fruitful collaboration with the Ecor and NaturaSì organic stores, this year our VEG BAG contains even more products, and we have also involved a higher number of companies that distinguished themselves for the raw-material quality and their working, packaging and supply process. Soon online addtional information to book your VEG-BAG 2013!